So, are you ready for my monthly 12 Kits of Christmas post? This month Joyce was our hostess and she is interrupting the regularly scheduled 12 Kits of Christmas to bring us a new program! 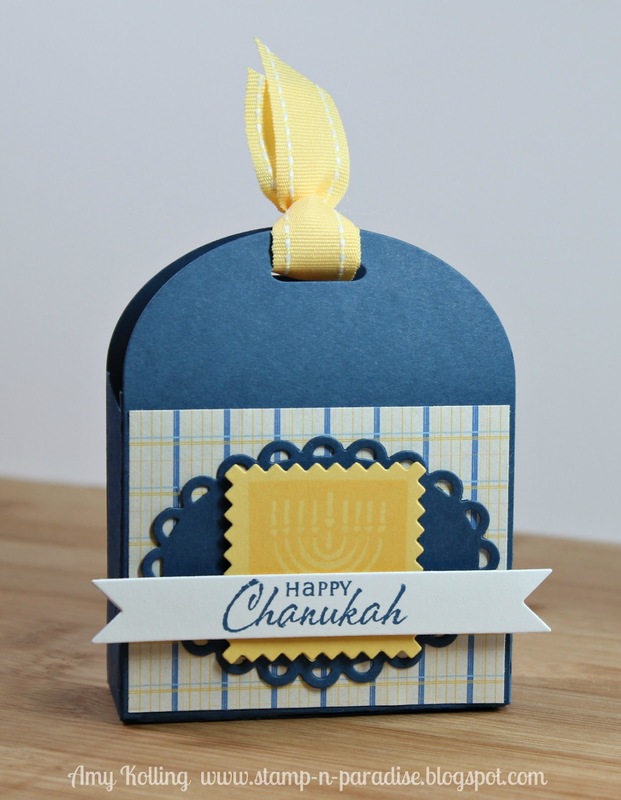 We are celebrating Chanukah here this month! Here is some background info: Chanukah, also spelled Hanuka or Hanukkah, is not a very important Jewish holiday, but it is a fun one, nevertheless. It celebrates the rededication of the temple in Jerusaleum after it was attacked by the Greeks, and is also known as the festival of lights. It is normally celebrated by lighting candles on a Menorah, playing dreidel, and eating latkes (Potato pancakes). And, of course, presents. In 2012, Chanukah starts the evening of Saturday, December 8 and ends the evening of Saturday, December 16th. First of all, aren't the colors of this kit incredible? So bright and cheery! I chose to create a little favor it box that was entirely embellished with ingredients from this kit. This box can be filled with Chanukah Gelt (chocolate coins) for a fun little gift. Here is the list of wonderful, talented, awesome ladies that help us celebrate each and every month. 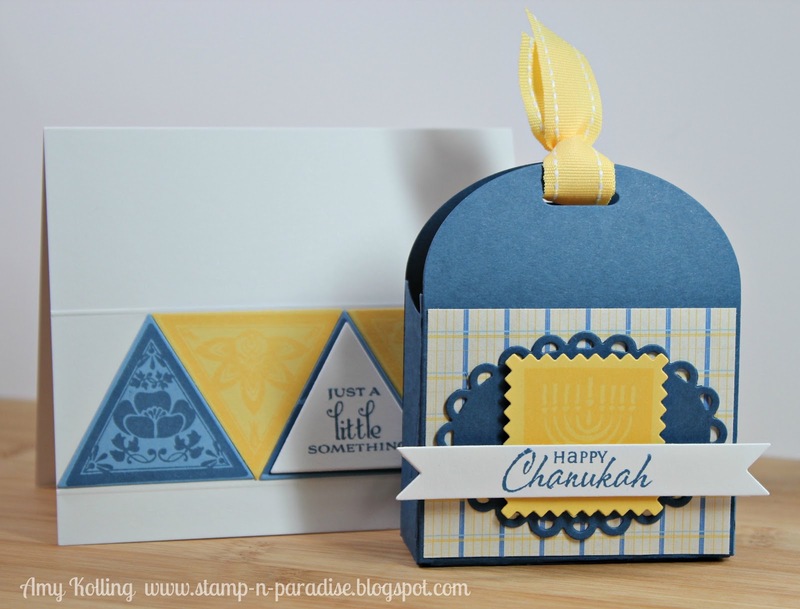 Please go check out their blogs and see what they have created with Joyce's Chanukah kit! Hi all! I've got a sweet CAS card today using the newest EXCLUSIVE stamp from the May Market Fresh Kit......this awesome butterfly! I have had some things going on lately and well, just not enough time to get it all done. Pair that with our 21 yr old niece moving in with us this weekend! Yikes......her room is NO way near clean!! Have you checked out the latest MSS Paint the Town challenge? If not, you most certainly need to! 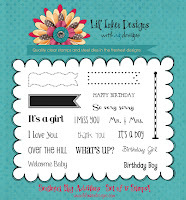 You have the chance at winning a stamp set of choice ($15 value)!! Hi everyone! Today is the last day of inspiration for the Lil' Inker Designs May Release! From the response we've seen so far, I'd say you like the Bow Dies and the Texture Plate! Yippee! 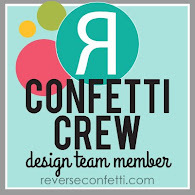 Today you are hopping along with the entire DT and you should have arrived from our awesome leader, Laura's blog. 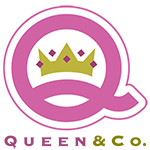 She has released some AMAZING new product and it was absolutely so fun to design with this month. Thank you Laura! My first project uses a new "Additions" set to the previously released Sentiment Flags called Sentiment Flag Additions! 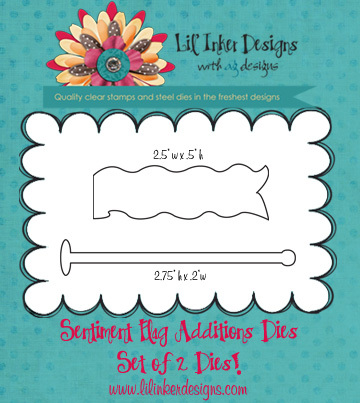 Wow.....I love the new things she included with new stamps........a new flag die and the sentiment flag pole die! The addition of these to the lineup makes this such a versatile set to have! This card is totally inspired and CASE'd from my friend, Gayatri. She made this fabulous card HERE and well, it just had to be done. Thanks Gayatri! My second card uses a favorite layout of mine (like the one above) and I promise to not use it so much in future posts! LOL Anyway, this card I've used the new wavy flag die to die cut many flags out of the new paper line by MME......Indie Chic Saffron. I've then arranged them to form a flower of sorts and added a big button from my stash. The sentiment is from the Flags and Tags set that can be found in the Lil' Inker Store HERE. 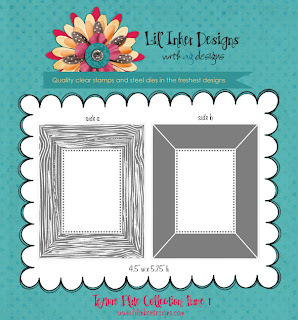 I hope you have enjoyed this release from Lil' Inker Designs......I know I have! 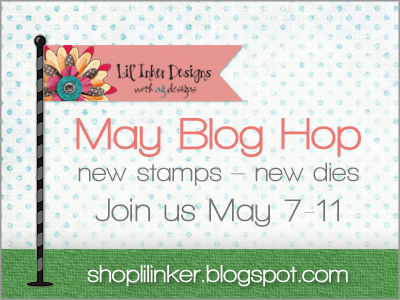 Your next stop on the Blog Hop is the talented Debby! Have a great weekend everyone! Since I am currently in the middle of the Lil' Inker Designs May Release, I thought I would share one more card using the NEW Texture Frame! Oh goodness.....love this frame! The flower die is the Dancing Tulip die from Memory Box. 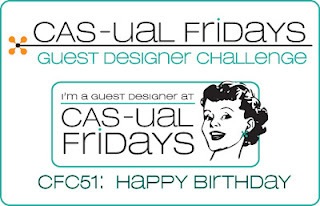 This card is going over to the CAS-ual Fridays challenge this week for BIRTHDAYS! More fun from Lil' Inker Designs today! Are you ready? You should have arrived from Laura's blog. 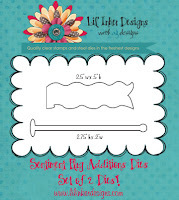 I am super excited to share a new product to the LID line-up.....Texture Plates! One side has a Woodgrain "Frame" and one side has a Plain "Frame". This texture plate works with any die cut machine using your usual embossing pads but for a limited time you can get them from LID if you don't have any! I have 2 cards to share today. 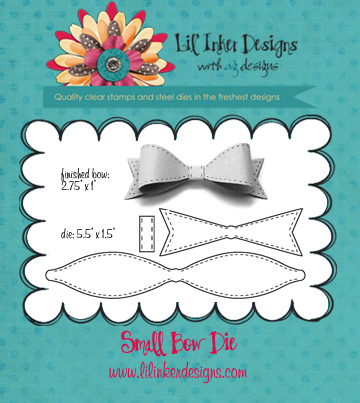 First up, is the new Texture Plate paired with the new small Bow Die. It's not too early to make your Father's Day cards and that's just what I did! I've used the Woodgrain Texture Plate to "frame" a Father's Day ribbon! The tails of the ribbon were stamped with the Houndstooth pattern from Flags and Tags (previously released). I love how this turned out!! My sentiment is also from this set but I just masked off the words to make them fit on my award ribbon! My second card focuses on the Plain side of the plate. This card is for my MIL....she will LOVE it! I've used this side to "frame" a family photo taken recently on vacation. I've kept this simple for the sheer fact I didn't want to take away from the photo. That's it from me today but I will have another card tomorrow using this Texture Plate for a very CAS card. Until then there is lots more inspiration from the DT showing off these dies so go check them out! Remember the prizes? This month's prizes will be a $10 store credit and a Sentiment Flags Additions set. Oh, and before I forget.....these and all the other goodies we are releasing are available RIGHT NOW! Check it out HERE. Hi everyone! Whew has it been a busy week! 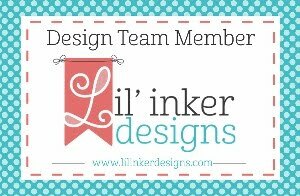 But I'm back with FUN, NEW, goodies from Lil' Inker Designs! Wait till you see what Laura and Ariana have for you this month! 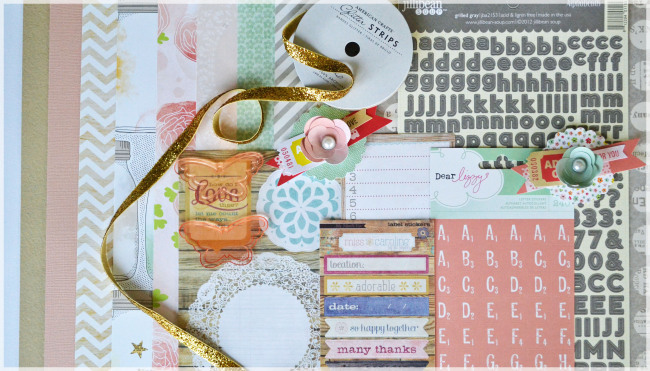 Today we are showing off HOT new dies that you will surely fall in love with! So without further ado, I introduce BOW DIES! She was not happy to have to take this picture today! My second project will be going off to my daughter's teacher as part of her Thank You gift for the wonderful school year they've had! We love Mrs. Bazil and couldn't have been happier Payton was lucky enough to be in her class this year. I found this adorable glass jar with the cute little red gingham cloth and knew it had to have a red bow for the top! I also used a previously released stamp set called Flags and Tags to make the label. Don't you just LOVE that font? So perfect for these types of gifts! This bow was created using the LARGE bow die and red felt. Again, I found it very easy to just stitch the layers together on the backside. 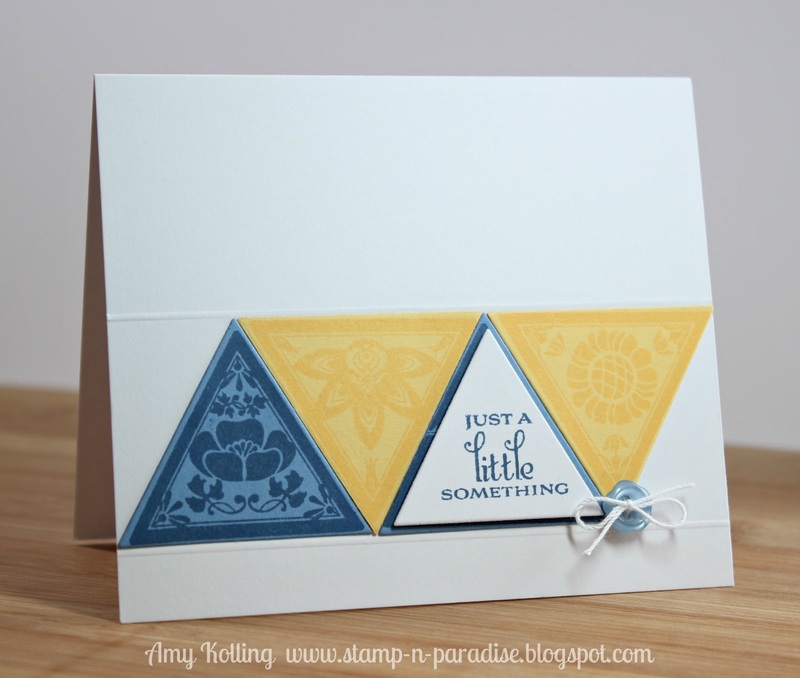 That's it for me today but there is lots more inspiration from the DT showing off these dies so go check them out! Remember the prizes? This month's prizes will be a $10 store credit and a Sentiment Flags Additions set. Oh, and before I forget.....these and all the other goodies we are releasing are available RIGHT NOW! Check it out HERE.